Industrial Vacuum is always working to meet the ever changing needs of our clients. Recently health and safety standards have become stricter in order to protect the well-being of staff members exposed to dangerous and hazardous materials on a day-to-day basis. We found that after OSHA updated their respirable crystalline silica standard, more and more contractors and general construction workers were in need of a new type of dust collection system. It is not feasible to continually move or even fit large dust collection systems into some workspaces and on numerous jobsites. To work around this issue but maintain clean-up standards as defined by OSHA’s newest regulation, our sales and engineering staff teamed up to created our newest dust collection system: the Filt-Aire 2,500 CFM Portable Cyclone. This powerful and compact model provides a solution to the concerns that various clients were having. Specifically, our clientele in the construction industry face a lot of these struggles as there are several small scope projects and assignments that are performed in tight, enclosed workspaces. Sandblasting – Sandblasting involves cleaning, roughening, or smoothing the surface of another material by forcing solid particles across the surface at high speeds. This is an extremely abrasive process and is performed by using a jet of sand that is usually driven by steam or compressed air. When finished, there is often a layer of fine sand or dust that lines the work area. Our PDC-2500 works perfectly as a sandblasting vacuum and can collect these fine particles as they are produced. It also can be used while abrasive blasting to capture the airborne dust created and keep the visibility and dust exposure to a minimum. Concrete Cutting & Grinding – While concrete grinding and cutting are different, they are very similar in terms of their end result and need for clean-up. Cutting concrete, as well as similar materials such as asphalt, brick, and mortar, is a method often used to create entry ways and for new building construction. Concrete grinding is often used to smooth and repair worn-out and impaired sidewalks, roads, parking lots, and highways offering immediate enhancement and surface evenness. Most grinding and polishing tools have hose connections on them for capturing the dust and debris. The PDC-2500 can be adapted to fit almost any piece of equipment. Once complete, this type of work leaves a layer of dust and fine sand often containing respirable crystalline silica or other hazardous substances that impede on the overall wellbeing of employees. Our PDC-2500 is equipped with an adjustable 55 gallon drum adapter and dust & debris dropout drawer that makes it possible to clean-up an entire workspace without needing to empty the drawer every few feet. Once clean-up is complete, the dust and debris dropout drawer can be easily removed, emptied, and cleaned allowing it to be ready for use again in minutes. Metalworking & Fume Extraction – Another area of construction that can negatively affect the health of employees is metalworking. 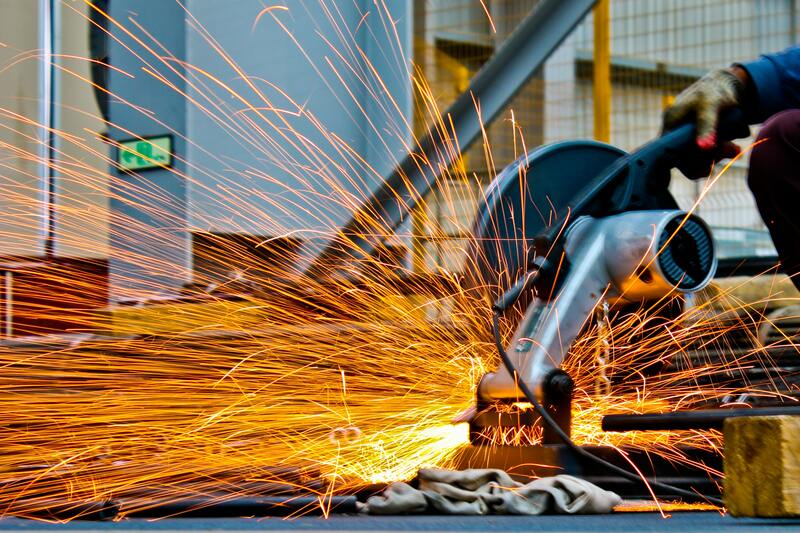 There are several types of metalworking but two of the most common are welding and soldering. Both methods involve joining together two pieces of metal by heating the surfaces. Soldering requires heating two pieces of metal and joining those pieces together with a joint in the middle, while welding requires heating the pieces of metal to their melting point and pressing them together until they are completely fused. These methods extract fumes like nitrogen dioxide, carbon dioxide, carbon monoxide, and several other hazardous gases. If employees are subjected to prolonged exposure to the fumes put off by welding and soldering, they increase their risk of lung damage and various types of cancer, including lung, larynx and urinary tract. Additional adverse health effects from certain fumes may include stomach ulcers, kidney damage and damage to the nervous system. Maintaining clean air is extremely important and often requires the help of an industrial fume extraction system like the PDC-2500. With electric and gas powered models built with a four-stage HEPA filtration system, our latest Filt-Aire Portable Cyclone makes clean-up within the construction industry a breeze. From fine particles to dangerous fumes, the PDC-2500 has the ability to collect hazardous materials and stop them from contaminating the air and negatively affecting employee health. While the construction industry has many facets that benefit greatly from our new PDC-2500, there are a number of other industries that this system can be used for. To learn more, get in contact with one of our sales representatives today. With options for rental or purchase, Industrial Vacuum has a solution for everyone.